Zillow"I threw what I thought was going to be a small home up, and it kept growing," says homeowner Steve Catsman. Steve Catsman's dream house in the wilderness started as a collection of pre-Civil War cabins and a barn. He disassembled them in Kentucky, Ohio and Tennessee and shipped them across the country to the mountains nine miles outside Telluride. 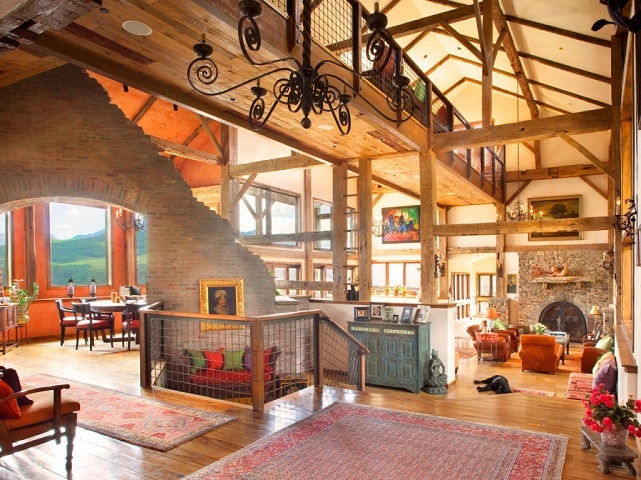 There, he put them back together as pieces of an 11,729-square-foot luxury mountain home. The home at 685 Wilson Way, completed in 2003, is now on the market for $10.25 million. The listing photos provide a tour of luxury with spectacular views, and of Catsman's life of travel. He's selling the home to spend more time exploring abroad. The neighborhood, Mountain Village, is a high-end town near the ski resort that is home to retired CEOs and also to Oprah Winfrey, to whom Catsman sold 60 acres in March. Catsman, an agent with Telluride Real Estate, developed 12 homes in the area, along with 16 miles of trail. "I threw what I thought was going to be a small home up, and it kept growing," he said. Much of the home's design is in the vein of other Colorado mansions -- brick fireplaces, beamed ceilings, log-cabin walls. But Catsman calls the patio "the palapa," a reference to tropical outdoor entertaining areas. The triangular bridge that connects the house to the home's patio was inspired by a trip that Catsman and his wife took to the Himalayas, particularly Bhutan. The front door came from an ancient Indian palace. The home has two master suites, a game room, a private gym, an in-ground hot tub and an observatory for stargazing. The decks offer 360-degree views of the mountains, town and ski resort. Catsman said that it's not unusual to run into elk or a mountain lion during his commute to and from work. "It's usually just me, and the elk or the deer," he said.